Just in time for Christmas, it’s always fun to check out the year’s newest and coolest gadgets. Technology plays such a dominant role in all of our lives, that it’s always a helpful venture when you seek out new, fancy gadgets and gizmos. Don’t worry. The more complicated the technology is, the more excellent the IT options will be if you begin to have problems. If you’re not sure where to start your discovery of the newest and coolest gadgets, then you’ve come to the right place. Here is a quick look at the top five neat gadgets to discover just in time for Christmas. 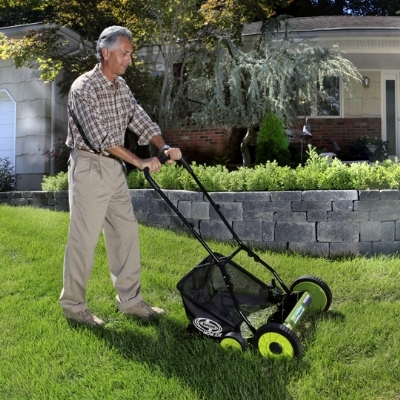 It may look like a toy, but the new Sun Joe lawn mower is no joke. It only comes equipped with a fourteen inch blade, but it will do the job just fine. It’s compact design makes for an easy and swift turn around those trouble bushes and trees. The coolest feature of this mower is that it’s electric. No more of those pesky trips to the gas station in the middle of a mowing job. It’s also a relatively inexpensive mower. It will only run you a little more than a hundred bucks. Just remember, this mower is designed to “maintain” your lawn. It isn’t designed to mow down a forest behind your house. Digital insoles provide the ability to warm your feet with the push of a button. They’re wireless, of course, and work on a bluetooth connection to your phone. They will track your steps as well as provide a quick warming solution for those cold toes. You also have the capability to warm your feet differently or separately, which is pretty cool. Not to mention, this was a Kickstarter project that grossed double what they asked for. You’d be helping out a team of young entrepreneurs. Belty the smart belt can assist you in your fitness efforts, but it won’t chastise you if you eat too much pie over the holidays. This belt is designed to let itself out a bit when you sit down with an unusually full belly. It will do the reverse if needed too. Belty comes equipped with the technology to provide you with valuable data about your health and wellness, or it can just be your most understanding piece of clothing in your wardrobe. You can choose how you utilize it’s capabilities. If you’re like “some” people, you can’t stand it when you’re away from your animals for too long. You miss them. Well, the PetCube offers a solution to this issue. It has a camera that works both ways and comes equipped with a built in laser. You can play and talk to your animals while you’re away. If you don’t have time to exercise your animals daily, then you can set up an automated schedule for the laser to become active. Which Live Arcade title have you bought?